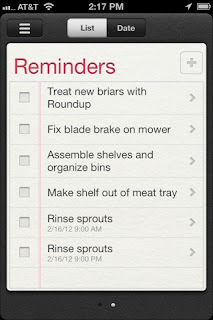 After I updated my iPhone 4S to iOS 5.1 the Reminders App was all messed up. When I started the app I just got the Completed list and that was it. Everything was gone and I couldn't find a + symbol anywhere. There was no list for adding reminders. It was very frustrating. I looked in Settings for a way to fix it and didn't see anything. I searched the forums and couldn't find any mention of this problem. Last night I finally figured it out. They added iCloud Syncing for Reminders. So I looked in the iCloud menu of Settings and found that Reminders was Off. I turned it on and all of a sudden all my reminders were back and I had two lists and could add stuff again. Screen shot simulating the original state. screen available with a swipe. So if your Reminders don't work, go look in Settings under iCloud and turn it on. If you don't actually want to sync over the air turn it off again. Should stay fixed.